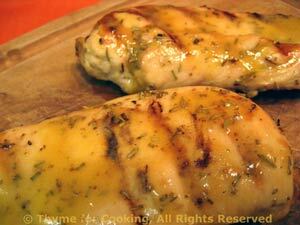 Thyme for Cooking Dinner tonight: Grilled Chicken Breasts, Honey Mustard Glaze. 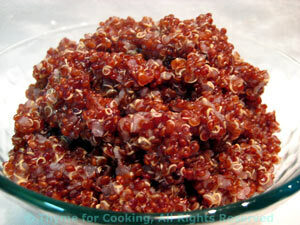 Quinoa comes in tan, red and black but is all treated the same and tastes much the same. The zucchini uses up the onion from Day 1, The rest of the pepper will be used in the Chicken Barley Salad. The chicken breasts are first marinated in lemon, oil and garlic, then grilled and basted with a lemon, honey and mustard mix. Since we are using the reserved marinade as a basis for the basting sauce resist the temptation to taste it. And stop basting a few minutes before the chicken is done, to finish cooking the sauce. In small bowl mix lemon juice, oil, herbs and garlic powder. Place chicken breasts in a dish with sides and pour marinade over. Let marinate 10 - 15 minutes or up to 4 hours in the refrigerator. Remove from marinade, reserving marinade. Pour reserved marinade into a small bowl. Add honey, mustard and whisk to combine. Cook chicken on barbecue grill for 7 - 10 minutes per side, or until done, basting with marinade sauce. Could also be sautéed in a nonstick skillet for same amount of time. Discard any leftover sauce. Serve. Quinoa is very high in protein and "contains a balanced set of essential amino acids for humans, making it an unusually complete food" according to Wikipedia. It's also easy to cook and tasty - what more could we want? You can substitute Basmati or Jasmine rice. Rinse quinoa if needed (most comes washed). Reduce heat and simmer until done, about 15 minutes (or whatever your package says). Serve. Use a smaller zucchini (courgette) for this dish. The red pepper, chili powder and Worcestershire add just a slight amount of heat. Slice red pepper, then cut slices in half. Heat oil, chili powder and Worcestershire in a large nonstick skillet over medium heat. Add onion and pepper and sauté for 5 minutes. 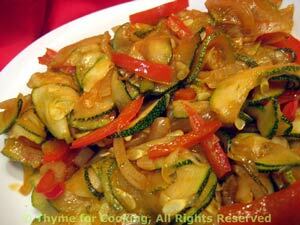 Add garlic and zucchini, sauté until zucchini is tender, 5 - 8 minutes longer.